Myocardial infarction (MI) or acute myocardial infarction (AMI) is the death of heart muscle from the sudden blockage of a coronary artery by a blood clot. Myocardial infarction most commonly due to occlusion (blockage) of a coronary artery following the rupture of a vulnerable atherosclerotic plaque, which is an unstable collection of lipids (cholesterol and fatty acids) and white blood cells (especially macrophages) in the wall of an artery. 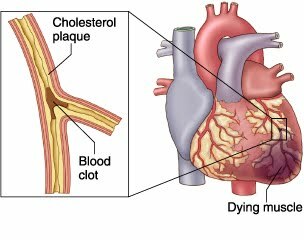 The resulting ischemia (restriction in blood supply) and ensuing oxygen shortage, if left untreated for a sufficient period of time, can cause damage or death (infarction) of heart muscle tissue (myocardium). changes in the frequency of heart rhythm. lung development is not optimal. retention of sodium and water. imbalance between myocardial oxygen supply and needs. This was a very informative post. Thank you.